The Council for the Regulation of Engineering in Nigeria (COREN), has commenced a re-accreditation process, aimed at evaluating the standard of Engineering programmes offered in the University. Speaking during a Courtesy Call on the Vice-Chancellor, the accreditation team leader, Engineer (Professor.) Emmanuel Ajav stressed that accreditation of Engineering programmes is a mandate of COREN in accordance with the Act setting up the Council. The process, Professor Ajav disclosed, was about quality assurance and it is aimed at ensuring that products of Engineering programmes in Universities, Polytechnics and Technical Colleges are sound and better equipped to meet the challenges of the society, in order to compete favourably with their counterparts anywhere in the world. However, Professor Ajav insisted that products of any unaccredited programme would never be registered or recognised by the body even if it is eventually accredited. He solicited for the cooperation of the University Community towards securing re-accreditation, assuring the Vice-Chancellor that COREN will disclose the outcome of its evaluation later. The team leader thanked Professor Salako for his favourable disposition to Engineering in the University, adding that with a well developed Engineering College, the pride of the University will reach its pinnacle. 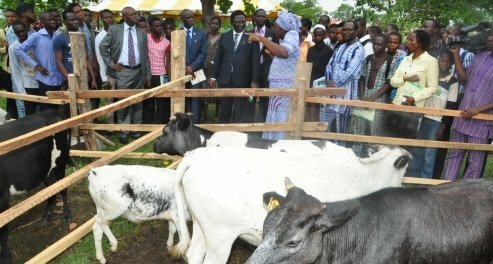 Responding, the Vice-Chancellor, Professor Salako commended the team for the re-accreditation drive, noting that he had been with Engineers in the past, moreso that Agriculture needs Engineering to thrive. Professor Salako re-emphasised the need to explore Engineering for agricultural development in the University. He charged the team to feel free to conduct their duties, while he re-affirmed his trust in the College of Engineering(COLENG) and the Academic Planning Unit(APU) to have done the necessary preparation ahead of their visitation. The team was later conducted round the College of Engineering facilities and other designated areas of interest.